When you notice that the steering on your riding mower is out of whack, it's imperative that you stop the machine and investigate further immediately. 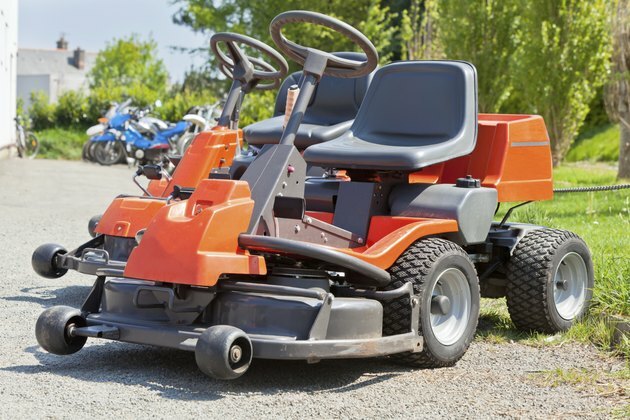 A mower with steering problems is a danger to you and others when the high-powered piece of equipment doesn't respond to a turn of the wheel immediately. Steering problems may arise from a multitude of causes, many of which you can repair yourself. Tire pressure is one of the easier problems to remedy when it comes to steering problems. Tires that are over- or under-inflated can cause steering problems. Check your riding mower's operator's manual to ascertain the correct amount of tire pressure for the mower's tires and then use a tire gauge to check each tire. If the psi of any of the tires is off, inflate or release air from the tires until they match the correct amount of psi suggested in the manual. If you've recently hit a stationary object like a tree, curb or brick or stone wall, it's possible you've dislodged the gear that controls the steering system. Once out of position, the gear won't right itself without your help. Simply loosen the bolt that holds the steering gear in place, turn the steering wheel fully to the left and listen for the sound of the gear popping back to its rightful position. Tighten the bolt after the repair and proceed to mow the lawn as usual. If the gear is damaged beyond repair, replace it with a new one. Another consequence of hitting a hard object with a riding mower is a dislodged ball joint. When the ball joint pops out of place, the steering suffers. Examine the mower to determine whether the ball joints are in place. If one or more have been dislodged, loosen the bolts on the ball joint assembly, pop the ball joint back into place and tighten the nuts until they're secure. Turn the steering wheel to the right and left afterward to see if the wheels respond appropriately. When the steering system bushing becomes worn or damaged, the steering may fail to respond as it should. The steering system bushing is located beneath the steering gear. To replace the bushing, remove the nut that holds the gear in place, pull the gear off the machine and remove the bushing that lies underneath it. Insert the new bushing, replace the gear and reinstall the nut that you removed to get to the gear and bushing.